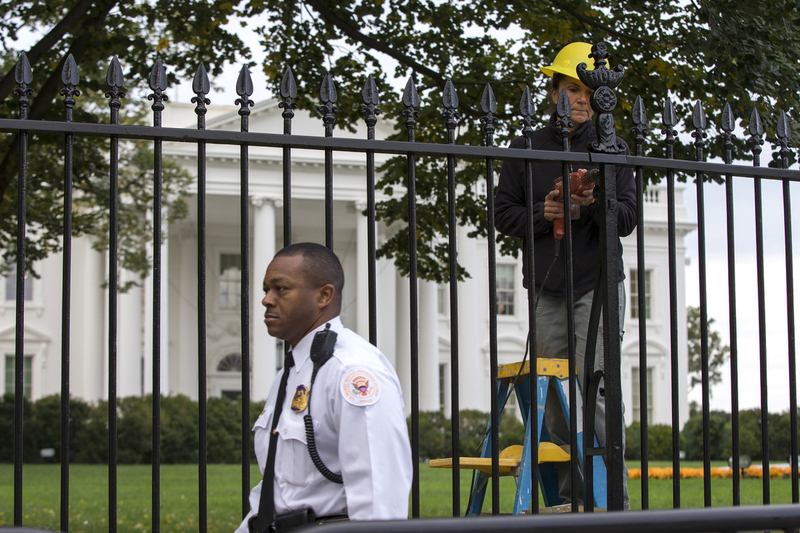 Second White House Fence Jumper Had Been Arrested Before : The Two-Way Dominic Adesanya, 23, has been charged with two misdemeanors. Adesanya was stopped on the White House lawn by two Secret Service dogs. A Secret Service police officer walks outside the White House in Washington on Thursday. The man who jumped the White House fence on Wednesday night has been charged with unlawful entry of the White House grounds and harming animals used in law enforcement. "The dogs, Hurricane and Jordan, helped stop the fence jumper in his tracks on the White House lawn. "They were taken to a veterinarian and treated for minor bruising. Adesanya is a 23-year-old from Bel Air Maryland and is charged with two misdemeanors, both punishable by up to a year in prison. "The Secret Service says he was unarmed when he jumped the fence. Last month a man with a knife made it all the way into the White House, setting off a scandal and prompting the Secret Service director to resign. This time, the K-9 unit was deployed and the jumper didn't make it very far." "Adesanya was arrested July 27,2014 and charged with unlawful entry of the White House complex. He appeared in the Superior Court of the District of Columbia and was released on July 29, 2014 and ordered to get an outpatient forensic screening. Mr. Adesanya was due back in court on Sept. 9, 2014, and failed to appear. A warrant was then issued for his arrest. "Mr. Adesanya was arrested a second time on July 30, 2014. He was charged with one count of unlawful entry at the U.S. Treasury Department building grounds, as well as three counts of assaulting, resisting or interfering with a police officer. He was released on July 31, 2014. He was due back in court on Sept. 9, 2014 and failed to appear. A warrant was then issued for his arrest." Tamara, by the way, has a nice post over at It's All Politics about the Secret Service pooches.